When it comes to innovation and state-of-the-art technologies, the Swiss Federal Railways (SBB/CFF/FFS) in Switzerland may lead the pack. And I was honored and privileged to have my team work at the cutting-edge of this innovation in the area of mobile devices. If you’ve ever taken a train in Switzerland, then you probably know how much the Swiss Federal Railways rely on mobile devices. The train drivers use them as an intelligent console for driving their trains. The infrastructure crew uses them for assembling the trains. The train conductors use them for all their tasks: ticketing, validation of tickets, reporting people without tickets, and the like. And a very special subset of train conductors (called the Frequenzerhebung team) uses special mobile devices to conduct from/to passenger surveys. The “new school” mobile device ELAZ (left) and the “old school” mobile device ZPG2 (right). The next-generation of mobile device in this area is called ELAZ, which is short for Elektronischer Assistent Zugpersonal. Back in 2010 there was no clear “winner” in the mobile platform arena, so after a lengthy evaluation process we selected Android to be the platform – and now, several years later, the further development of Android and its growing marketshare show this was not a bad choice! 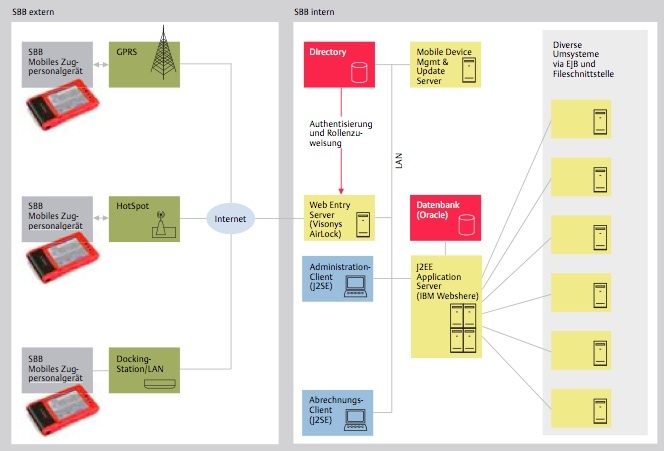 Rather than a quick-and-dirty porting of the existing J2SE/J2ME apps to Android, we carried out a full re-analysis of all the business processes. Here again: the SBB wants to lead innovation and, if possible, invest money wisely – so that the effort invested in the beginning will carry through for as many years as possible. Frequenzerhebung – Why do they keep asking me where I am going? I’ve gotten that question a lot: why do some SBB train conductors survey passengers about their journey start and destination? The short answer is: the data are used for a lot of purposes. But probably the most important use of the data is this: in Switzerland public transportation is composed of hundreds of independent companies that try to work together as seamlessly and transparently as possible. The SBB, being the largest, is responsible for the overall revenue collection – and this revenue must then be re-distributed to all the transportation partners. Data collected by these specialists is used for this purpose. But what you might not know is just how much of a specialist these special train conductors – who use a very special device – are! They are not just asking you about your start and destination, but in fact they are collecting a huge variety of other data that you might not see: which wagon numbers of which trains, total number of people in which wagon, etc. (Behind the scenes, there are literally dozens of software systems that are tied together in order to carry out this mission-critical job.) In my own view I’ve always thought these hard-working train conductors deserve a lot of credit for their dedication!